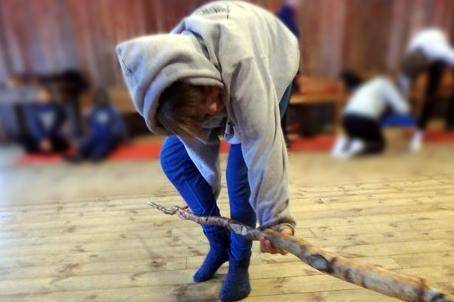 Traditional sport games is called Go´kar pieces in norwegians. It means a good man! Go`kar piece has been part of the culture of Valdres for generations. This activities is perfect for you who want to dive into the local history and really exsperience be like a local. Strength and agility in old days could be measured and tested through Go´kar pieces. This was a way for men of the day to show themselves, above other men, and especially to women. Show who was the nicest, best looking and who really was a good guy. Go`kar pieces can also be found in traditional dance, one example is "Hallingkast" where one should kick the hat down from a cane. These are fun exercises with different levels of difficulty. And its not only for men! Attendance is at Brennabu, we will be in Låvin. The instructor will initially briefly explain what Go`kar pices is, and demonstrate and show the first piece. Then it will be your turn to try. There are many different pieces, most of which are individual, while some are made together with each other. Go`kar pieces have funny names like, "thred the needle" and "milk the bear". Here, no one is making mistakes, and the instructor will provide guidance along the way and good tips for you to get it done. Have comfortable clothes / workout clothes.